Do you have quick reactions during tennis matches or do you find yourself trying to think your way through a match? 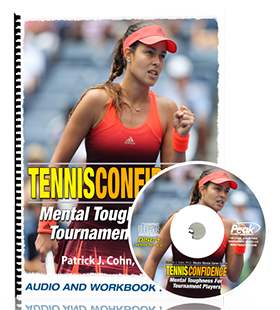 Many tennis players will over-think and second guess themselves throughout a tennis match. Maybe you were trying to consciously “outsmart” your opponent but it resulted in some poor play on the court. There is a big difference between thinking yourself through a match and effective decision making during competitions. Decision making is one of the most complex processes within sports and also one thing that can provide you a great advantage over your competitors. Luis Garcia-Gonzalez et al. conducted research to assess the effect of a decision making training program on decision making skills and performance in tennis players. In their research, Effects of Decision Training on Decision Making and Performance in Young Tennis Players: An Applied Research (Journal of Applied Sport Psychology, 2014), Gonzalez et al. found that tennis players can improve their on-court decision making with training and the help of an expert, such as a tennis instructor or mental training coach. 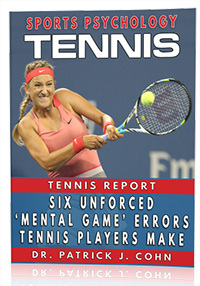 These include the type of shot (forehand), the effect of the shot (topspin), the direction of the shot (down the line), the depth of the shot (baseline) and the power of the shot, all while taking into consideration court conditions, the score, your opponent’s position, your opponent’s strengths, your opponent’s tendencies and your strengths. Over-thinking will interfere and impair with your performance on the court. Due to the many variables involved in shot selection and the fast-paced nature of tennis, it is important for tennis players to hone their decision making skills in order to improve their level of play on the court. Improved decision making will help you anticipate plays, pay better attention to performance cues, select better responses and react quicker during matches. Once you improve your decision making skills, the execution of your shots will vastly improve and so will overall performance. Gonzalez et al. concluded that ten sessions of decision-making training can help tennis players develop more effective on-court tools to assess certain aspects of performance and improve their performance on the court. Tip #1: You should review your recent matches with a coach or tennis expert. Evaluate critical points… What was the situation? What were the possible solutions? How did you respond and what was the outcome? What could you do differently? By evaluating your on-court decisions, you can start to see alternative solutions. Tip #2: You should create match conditions in practice so you can effectively train your decision making skills–this way you can react in matches and not become indecisive.